Canadian Lutheran Online » Blog Archive » Legal Weed: What does the Bible have to say about it? Legal Weed: What does the Bible have to say about it? Oh Canada, you trendsetter among the western nations, blazing (pun intended) a trail towards the legalization of recreational marijuana! On October 17, 2018, Canada will join the ranks of Uruguay, Spain and other countries which have federally legalized recreational cannabis. (While some states in the U.S.A. have legalized cannabis, our neighbours to the south still have laws on the federal level against such recreational use.) The move will fulfill Prime Minister Justin Trudeau’s 2015 election promise of making cannabis legal for Canada in 2018. Now that the legalization of marijuana seems inevitable, how should we as a church respond? What do we say to our friends, families, and co-workers as weed pops up around us? Is it wrong? Is it okay? Should we, as Christians, light up? Before we get to answering those questions, first a confession. Nearly three decades ago—long before becoming a pastor—I was a fairly prolific marijuana user. I wasn’t an “all-day” baked kind of guy, but instead the “once a day, every now and again” variety. It has been so long since I used it recreationally that a lot has changed, but I share this to admit to having personal experience with marijuana. 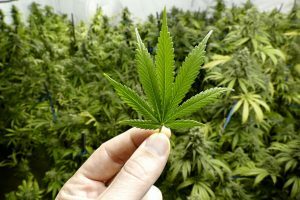 Some proponents of legalized cannabis suggest there are good reasons for Christians to support the use of recreational cannabis. An oft heard one is that marijuana is a natural product, and if it was put there by God, it has to be okay, right? The problem with this kind of thinking is that we simply do not know if marijuana existed from the beginning or entered the world after the fall of humanity into sin. God was clear about how the world, as Adam and Eve knew it, would change as a result of the fall—that the ground itself would be cursed and bring forth weeds of various kinds (Genesis 3:16-19). Another argument some put forward is the idea that cannabis use is explicitly mentioned in the Bible. They point to Exodus 30:23, which records the recipe for holy anointing oil. One of the ingredients is pronounced “kaneh bosem” in the original Hebrew. And while it may sound a little like “cannabis,” scholars prefer to translate it as “aromatic cane,” “fragrant cane,” or the like. Research supports the interpretation that this plant was of a “reed” variety—something which cannabis clearly is not. It was likely either “lemon grass” or “calamus.” While the sound of the Hebrew word might raise eyebrows initially, it’s not a convincing argument that cannabis is mentioned in the Bible. A third argument we hear is that cannabis should be treated as alcohol is, and that where Scripture speaks of alcohol we should apply the same principals to marijuana. However, to treat the two as the same without properly considering their different effects isn’t helpful. While Scripture clearly permits the use of alcohol in a variety of cases, there is no such permission for marijuana. Let’s consider the comparison between alcohol and marijuana in detail. In the following, I reproduce some of the insights of Rev. Jeff Lacine (author of the article “Marijuana to the Glory of God” ) intermingled with my own thoughts. While drunkenness is clearly prohibited in the Bible (Ephesians 5:8; Romans 13:13; Galatians 5:19-21; 1 Peter 4:3), God also permits the use of alcohol when used appropriately. He has given “wine to gladden the heart of man” (Psalm 104:14-15). He blessed for use in times of celebration as well as for communion (John 2:1-11; Matthew 26:27-29). It can even be argued that He has given wine as a cure for an anxious stomach and gut ailments (1 Timothy 5:23). Scripture clearly permits the moderate use of alcohol, enjoyed in faith, even though it has some psychoactive effects. If this is so, might God be equally okay with recreational use of cannabis? Well… it is not so cut and dry an argument. To be sure, cannabis and alcohol have some surface similarities. They are both organic substances. Both hold the ability to intoxicate and distort reality. Tolerances in the individual may determine how cannabis and alcohol affects a person, and both can be habit forming. But they also have their differences. On the one hand, an alcohol overdose can lead to a blackout or even death, while cannabis overuse doesn’t hold such outcomes. On the other hand, alcohol is more commonly accepted culturally and socially as fitting for use in celebrations and sacred ceremony, while cannabis holds no such eminence. What is more, you generally know what you’re getting when it comes to alcohol. The percentage of alcohol content in a beverage can help one to know what they can expect to feel, yet the same cannot be said for cannabis. There are so many different strains and potencies with cannabis that the user may feel nothing from ingesting one variety, whereas the ingestion of another variety can bring on deep psychoactive reactions, cause paranoia and in some cases, hallucinations. For these reasons, it is unhelpful to pretend that alcohol and cannabis are basically the same and therefore should be treated as such. Not only are their chemical makeups different, but the effects of their use are as well. Even though marijuana is not mentioned in the Bible, we can still look to it for clarity in how we as Christians are called to live. In Scripture we find that the ultimate goal for humanity is to know and experience God in His glory when we are resurrected (1 Corinthians 15:12–49; Philippians 3:20–21; 1 Corinthians 13:12). Let’s call this the ‘end goal’. The problem for us in the present is that we all have entered the world spiritually dead and unable to discern the glory of God. Sin has distorted our vision and left the world broken (Ephesians 2:1–5; Colossians 2:13; 2 Corinthians 4:4). Through Christ and His work, however, we are awakened to the realities that are God’s beauty and love for us His children. Guided by the Holy Spirit, we may know Him (2 Corinthians 4:6), yet may only see His glory as though looking through a glass dimly (1 Corinthians 13:12). As His redeemed children, we are now to journey in knowing Him without obstacles, to know Him as He reveals Himself in our lives by His Word to us. To this end, then, we should limit our use of psychoactive substances to those which align with this goal of seeing things clearly. Take coffee for instance, another organic substance with psychoactive properties. Ingesting caffeine serves to awaken the senses, to remove the cobwebs, and to help the user awaken to that which lies before them. Could the same be said for alcohol? At times, moderate use can be in keeping with the realities of God’s promises, helping to unfold them for us. During our own weddings, for example, where we rejoice with wine, we also celebrate the parable of the great Bridegroom who is coming for His bride, the church (Revelation 19:7). Further, we know that wine has its own God-given role at the final consummating celebration (Mark 14:23-25). If alcohol can be used in such a way, might there likewise be a moderate and proper use of cannabis that could clarify and make clearer deeper realities? I answer from both research and experience: rather than making things clearer, marijuana tends to distort and dull the senses. Instead of allowing one to experience true realities more clearly, realities are altered. Attention to things can be stunted, making it harder to focus. Ask almost anyone who has used marijuana regularly, and they will speak of the disconnect they experience from the realities of life, as well as the numbness that comes also. The fact that our culture associates marijuana use with a couch, snacks, and television is no mere coincidence. Nor is smoking cannabis and “engaged parenting” often (if ever) used in the same sentence. While the Bible does not forbid the use of every substance that affects the mind, recreational use of marijuana does appear then to violate the Christian value of sobriety in many cases (1 Thessalonians 5:6-8; Titus 2:2, 6: 1 Peter 4:7). As Canadian society embraces cannabis and removes the moral fence that has prevented many from trying or using it, we will need to watch that our brothers and sisters don’t end up in a cloud of smoke with vision blurred and numb to the realities our Lord wants for them to experience. At the same time, we must be careful not to judge too quickly and pull knee-jerk reactions to cannabis use as we are made aware of it. A number of people report positive relief from various ailments when it is used medicinally. At the same time, we must also mention the downside to health that is present in its use for others as well. Our goal in encouraging one another should be that of, seeking to see God as clearly as we possibly can as His return draws closer (Hebrews 10:25), and to build each other up as the body of Christ. Thus, in making our church members aware that cannabis use is problematic, we should be slow with church discipline, seeking first to understand and encourage, while all the time making clear that its use could have consequences. Let’s be quick to engage with members if they are using, to ask questions and gain insight, but also to be ready to exhort and rebuke them if it becomes apparent that they are violating the biblical standards of sobriety and integrity. The complexities and nuances of these encounters will undoubtedly be complex, but Christ’s Church—holding fast to His Word and led by a team of wise pastors and educated laity—will be up for the challenge. And wherever possible, may God give us opportunities to show the forgiveness of Christ and the blessings and peace offered in Him—something which no amount of alcohol, cannabis or anything can replicate. Rev. Perry Hart is pastor of Bethel Lutheran Church in Kitchener, Ontario.